Authorities in Darby, Delaware County, conducted sweeping drug raids this morning making over 75 arrests and serving over 100 warrants. "Operation Spring Cleaning" was the result of a six-month-long investigation that started back in October. 188 undercover purchases were made during the operation and $48,000 worth of drugs were seized. Darby Borough Police Chief Robert Smythe said, "We're not going to tolerate drug sales on our corners." 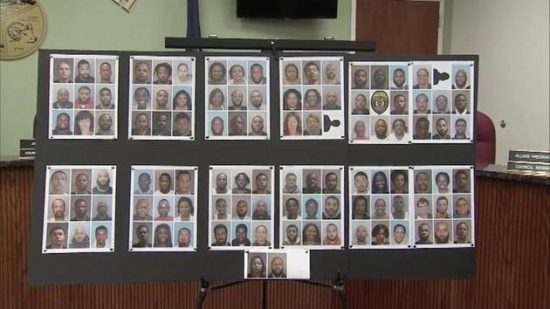 All of the arrests targeted individuals selling drugs. Multiple agencies cooperated in the investigation including the Delaware County DA, DEA, FBI, and police departments across Delaware County. A Lansdale man is now facing charges in connection to the fatal shooting of fellow church member during Sunday services earlier this week. 46-year-old Mark Storms is charged with Voluntary Manslaughter and Reckless Endangerment. It happened at the Keystone Fellowship Church on the 400 block of Stump Road in Montgomeryville during the 11 a.m. service. 27-year-old Robert Braxton III made a scene after being told he was sitting in someone's seat. Ushers talked to him and he began to calm down. That's when Storms approached Braxton and displayed a "concealed weapons permit" badge and told him to leave. Braxton swung at Storms, hitting him in the jaw. Storms then fired two shots from his .9mm handgun killing Braxton. Montgomery County District Attorney Kevin Steele says that this is not a reasonable self-defense situation. Philadelphia Police responded to a man with a sword in the Juniata Park section this morning. It happened around 11 a.m. on the 4300 block of K Street. They found the man outside and tried to use a taser to stop him. The man pulled the prongs out of his body and ran inside the home. The man barricaded himself inside. Police were able to take him into custody without incident at 12:30 p.m. No charges have been filed at this time.